One weekend, two of the most beautiful circuits in the World and a bunch of cool guys. That pretty much sums up my weekend with Rod, Antonio and John. I really had one of the coolest automotive weekends of my live. I left real early on Friday morning and drove to Liege in Belgium where Rod and the rest of the Speedhunters crew were staying. 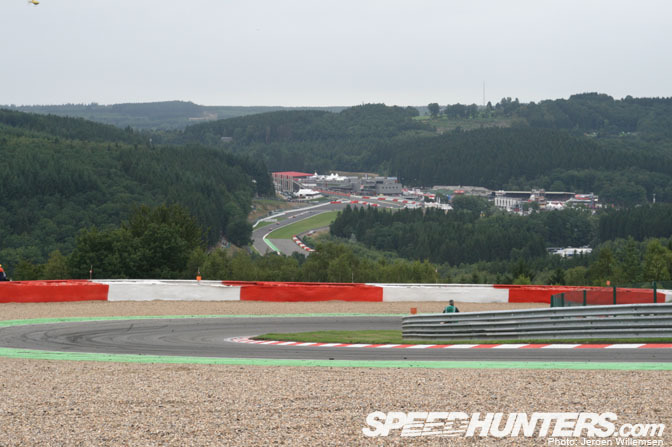 Once I arrived we headed straight to Spa and had a look at the training sessions on the circuit. I went there together with Rod in the new Porsche 911, the other guys took different routes and cars. The roads surrounding Spa are amazing, they are like the European versions of Japanese touge, especially when you driving in a Porsche. It seemed that the car had an endless amount of grip. After we all got to the track and we made ourselves comfortable at the press center, me, Rod and Antonio went out on the track. 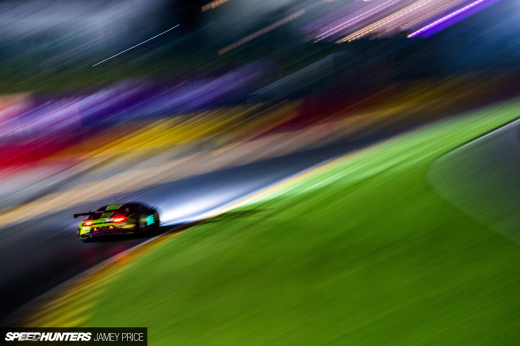 The Murciélago was one of my favorite cars during the 24hr of Spa. The sound it produced was amazing, it almost sounded like a Formula 1 car at full throttle. 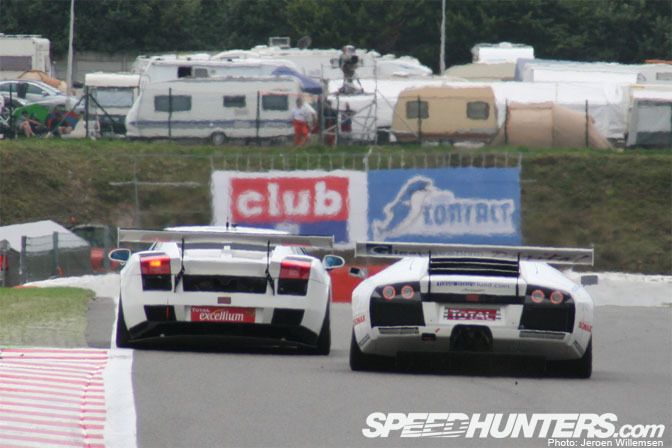 The Gallardo it was chasing was driving in the G3 class so it was no match for the GT1 car. After I uploaded the picture today I was really amazed by the heat wrinkles you see on top of both the cars. 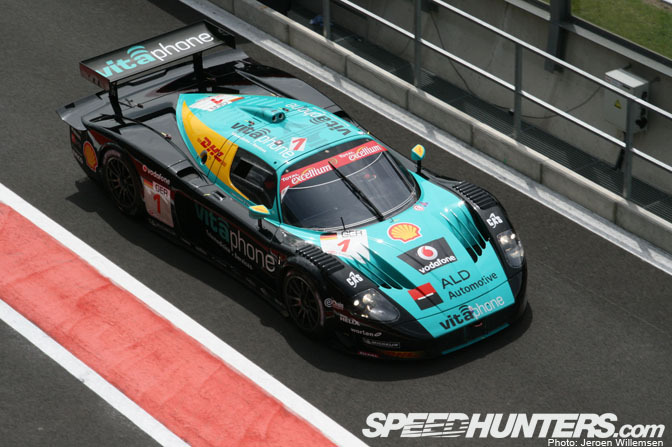 The Lamborghini Murciélago driven by Kox, Rusinov, Lammers and Enge would finish in 9th place after 24hrs. 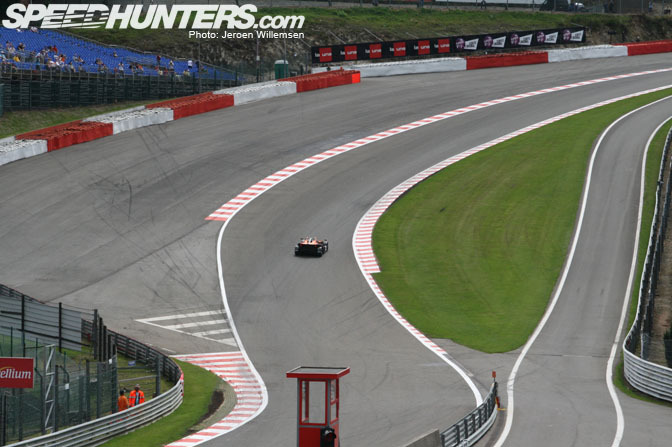 The first time you see the corner at Eau Rouge you are amazed at the angle it goes up, it's really something. It was very cool to see all the different techniques the drivers used to attack the famous uphill corner. The Porsches from the GT3 cup were doing their practice rounds and there were also a few other cars that were racing on the circuit. We were on the top of a building inside the paddock and we had a excellent few of Raidillon. That's the actual name of the corner at Eau Rouge. The car you see driving on the track is the KTM X-Bow. It's the first car that KTM built, they are mostly famous for their motorcycles. It is powered by a four cylinder TFSI engine built by Audi AG. The way it attacked the Eau Rouge corner was really spectacular because it went so far on the curbs it sprayed dirt up in the air. I never realized the track was this large, you can see the paddock and pit lane in the back of the shot. The total length of the circuit is seven kilometers. When you want to walk the entire circuit you will be busy for two hours, so luckily for us there were special press busses that would take you around the circuit. I went to together with Rod and his camera to shoot the 24hr race, I was really surprised as too how close we could get to the action. I already saw some of the raw footage we took on Saturday and all I can say is that they looked amazing, I can't wait to see the slow mo vids posted by Rod. 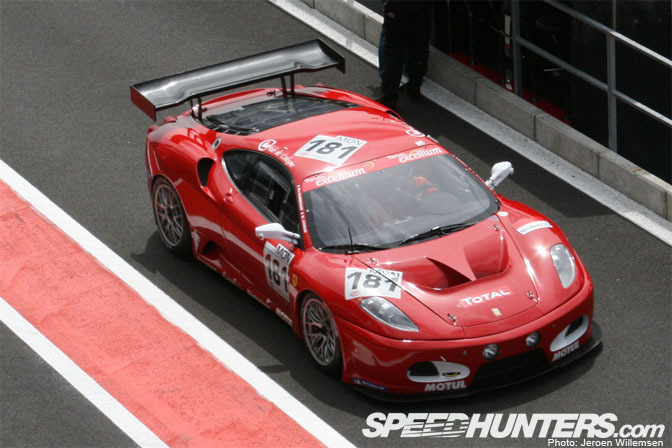 A total of thirteen F430's were entered. 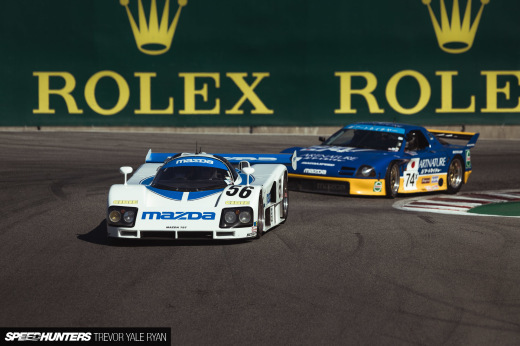 The battles between the different teams was very fierce because the cars are more or less the same so it all came down to the drivers. One of Antonio's favorite cars was the Aston Martin with the silver and orange highlights. The car right next to it is the Porsche 911 GT3 RS. 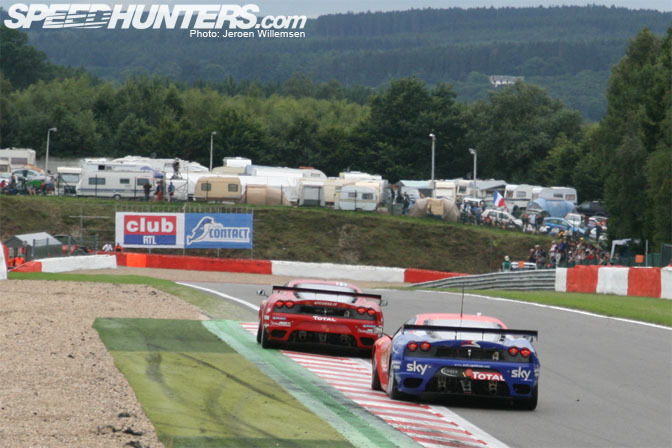 The red car in front is the Gillet Vertigo built in Belgium. 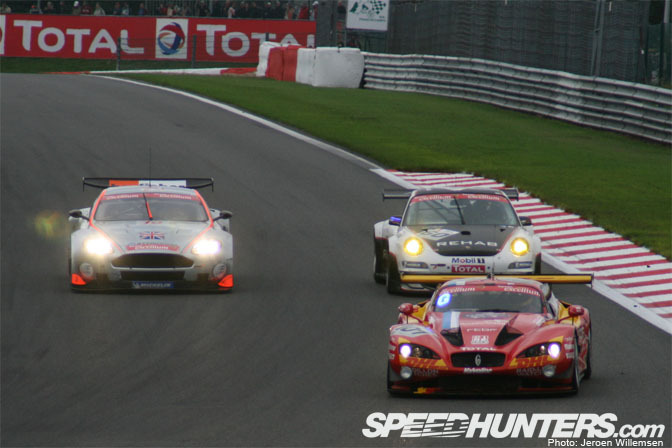 The Porsche and the Gillet got a blue flag which means they should get out of the way for the faster car, in this case the Aston Martin. Here's another shot of the Lamborghini Gallardo just because I love racing Lambo's. The car belongs to S-Berg Racing from Austria and it came out in the G3 class. On Sunday we woke up early, well at least I did, because Rod had set his alarm clock an hour to late. (sorry Rod) after I had breakfast we all got into our cars and drove off to the Nürburgring. You immediately know when you are close to the ring because you will see all sorts of high powered vehicles parked alongside of the road. We went to the Nürburgring for the Recaro Days and the IDC Drift event. The event itself featured all sorts of cars, there were a few very nice looking Audi's with camo paint jobs and very nice offset wheels. I didn't snap any pictures of the event itself because I was there for the drifting. Antonio did shoot some cool cars so expect a feature from him in a few days. The top three drivers came from Holland so I was a bit proud that they beat all the other drivers from Europe. Paul Vlasblom was crowned as the victor with his BMW E36 wagon after a very hard fought battle against Tim Tatje in his BMW Compact. 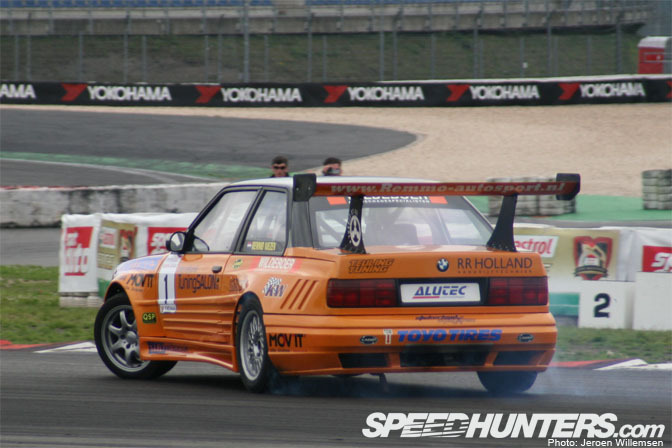 The third place went to Remmo Niezen in his newly built orange V8 wide body BMW. To close of this story I have this picture of a drifting truck, I bet you have never seen that before. 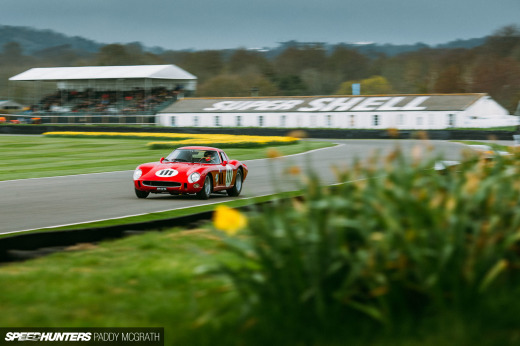 It was driven by a famous race truck driver that won several championships. After we left the track we passed the straight on the Nordschleife and we saw the truck going full throttle against race cars. The car really had a hard time in trying to overtake the truck. A big thank you goes out to Rod, Antonio and John for their help and great stories, THANKS. wow, looks like it was awesome. i love those lamborghinis and ferraris! some desktops maybe? I did like your story a lot. It is almost if I was there also. Go for it I will tell you. A verey proud mother!! I loved Remmo's old M3 with M5 engine, but I don't like the Testarossa look and rear spoiler on the new car. I totally agree with you Fred, allthough I do like the rear spoiler. Compared to the other cars it was one of the nicest one out there. I've seem to have let post slip by. Anyway good write up and photos young chap.